Michael Ball is the director of probably the most publicized and polarizing teams on the pro US circuit, Rock Racing. I used to completely detest everything about the team, from the way it was managed to ‘win or be fired’ attitude. To be honest though, the press conference for the Tour of California changed my mind a little bit. Ball presented a genuine sentiment for the riders on his team and the sport of cycling itself. He enjoys cycling himself and believes that cycling is truly a ‘cool’ sport and wants to share it with a wider audience. He wants to make cycling into more of a watch able and interesting sport than that weird thing your uncle does on the weekends. The idea that got me personally was his method for doing this. The past few years the sport has been plagued by doping scandals, which many believe is killing the sport by driving off sponsors and making the races unwatchable. What many of these people forget is that some form of cheating or another has been going on since the beginning of the sport, beginning with taking short cuts, then pain killers, and finally onto EPO and blood doping. I’m not saying cheating should be allowed, but that nothing has really changed in the cheating world (besides new ways to cheat) to cause this downfall of cycling. What has changed is press coverage. Now cheaters are getting 2 years suspension and a branding from the press so villainous that a casual observer would think they were mass murderers. No other sport in the world has such strict rules or harsh public opinion. Because of these harsh conditions the pro-cycling world has become more preoccupied with doping controls and scandals than the racing itself. Go onto Velonews.com at any time and half of the articles will be somehow related to cheating. The racer organizers have become so paranoid of scandal that organizations such as ASO (organizers of Tour de France and other races) would not invite completely clean teams that have had problems with doping last season. The omission of teams like Astana and High Road from the Tour de France is not only ridiculous but the sheer economic stupidity of it is unbelievable, the organizers are not just banning cheating riders but shutting out sponsors who are willing to put money into the sport. 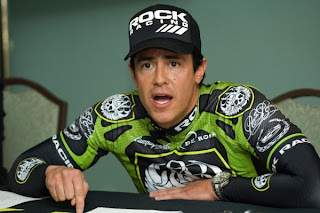 Ball’s premise for Rock Racing is that his riders’ (many of whom have been convicted of doping in the past) past are past and that the athletes deserve a second chance to let themselves prove to the public that they are athletes and not villains. Punishment is a necessary consequence of cheating but banishment from the sport is a death sentence for athletes whose careers are dictated by their sponsorship potential. This is a refreshing approach to the problem facing the present He also mentioned that the punishment of riders caught doping should be handled within the team as opposed to giving the rider to the media hyenas. I still don’t like Ball, I think his kits are ugly and the fact that he did the press conference in the kit instead of a suit was remarkably un-professional. But I also think that the sport of Professional cycling needs more team managers that are as committed to their teams and to bringing our sport into the mainstream. There have and always will be cheaters, in every sport, the sooner cycling comes to that realization the sooner it can get itself back on track. Previous Article← What happened to Steel?